Reformation Press offers [loading...] e-books, available from Amazon’s Kindle store. Sort books by newnessauthortitle . Rev Donald MacLean (1915-2010) was a gifted minister of the gospel whose pastoral ministry on the Isle of Skye and in Glasgow lasted over fifty years. He continued to preach after his retirement from the ministry in 2000 until a few months before his death. Many thousands heard his powerful preaching throughout these years and under the blessing of the Holy Spirit this was profitable to many people. 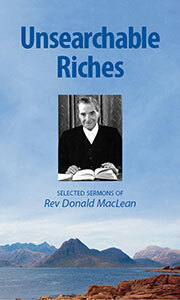 Unsearchable Riches offers a selection of Donald MacLean’s instructive and devotional sermons. The book begins with a sermon whose title epitomises the contents of the volume - ‘Unsearchable riches’. In addition to sermons dealing with the offices of Christ as Prophet, Priest, and King, other sermon titles are: ‘Ye must be born again’, - ‘The wise and foolish virgins’ - ‘Make your calling and election sure’ - ‘Seen of angels’ - ‘The still, small voice’ - ‘The Prince’s daughter’ - and ‘Brethren dwelling in unity’. The book fittingly ends with the last sermon Mr MacLean preached - ‘Come unto me’. The reader will find here solid expositions of Scripture, a rich covenantal theology, and a warm emphasis on Christian experience. The Church of Scotland issued this metrical version of the Psalms in 1650. 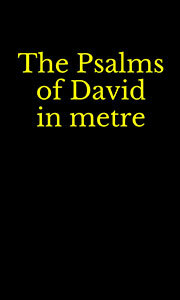 The Psalms of David in metre has been the manual of praise down through the centuries, not just in Scotland but in many other parts of the world. Along with the complete metrical version of all the Psalms, this e-book includes a brief history of the Psalter, along with information on the various metres used in the Psalter. The e-book includes a comprehensive index to keywords in the titles of the Psalms. In addition there is a handy alphabetical index of the first lines of all the Psalms.